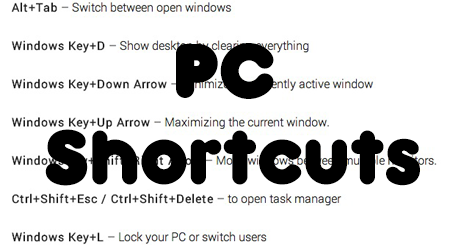 Do you know with shortcut keys on your keyboard, every PC owner can save a lot of time? Like Printing can be done with simply going to your file menu and hitting the Print option from there, but if you use a shortcut like CTRL button and the letter P (CTRL+P) it can get you the same result. So you can save a lot of clicks and seconds that you spend from your mouse and point, and aim is not always fun. Today like CTRL+P, I am going to provide you some shortcuts that can save a lot time and energy of your. This list is highly useful for people using computer and internet regularly so bookmark this page for future reference. Windows Key+Up Arrow – Maximizing the current window. Windows key+Shift+Right Arrow – Move windows between multiple monitors.